The application converts mouse and keyboard events to network messages that can be used locally or transmitted across a compatible network. Mouse to OSC is built within the Max/MSP environment and utilizes the Hewitt OSC NameSpace Syntax. To use Mouse to OSC just select the network transit required. You may also select to have the asci keyboard events passed onto the network. Mouse to OSC works with OSC, UDP, TCP, Multicast and net.maxhole network transits. 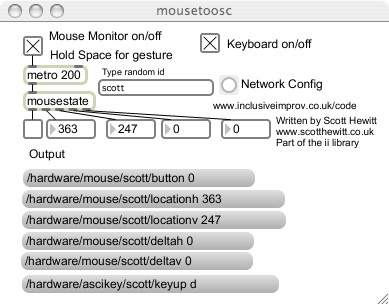 Mouse to OSC is available as an OS X application here.